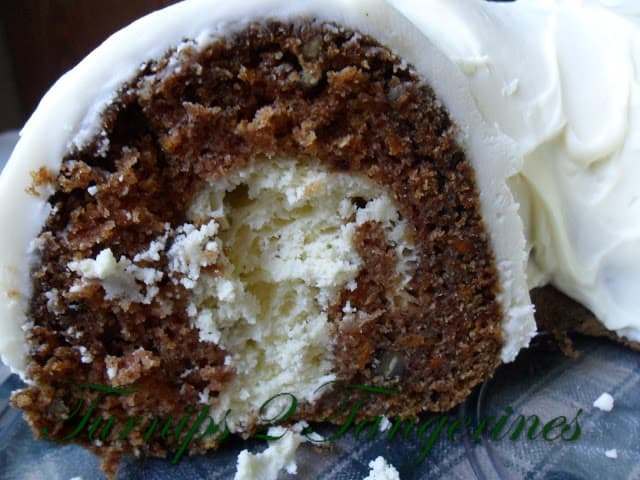 If you are a fan of Carrot Cake, you are going to Love this recipe. 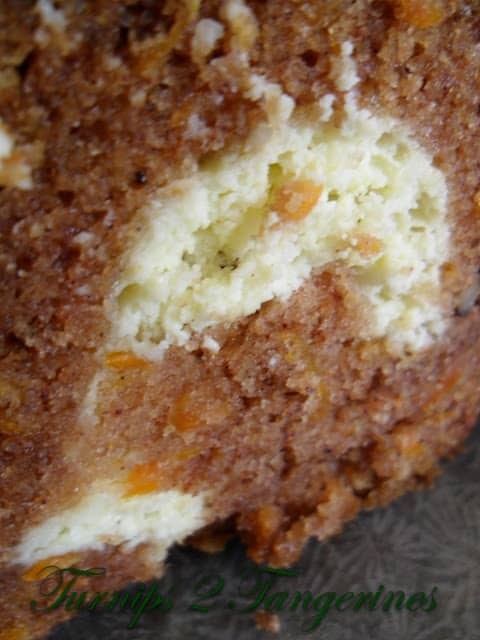 The “surprise” in this carrot cake recipe is the cream cheese center. This delicious Surprise Carrot Cake also has the traditional Cream Cheese Frosting that everyone loves on a carrot cake. My sister-in-law gave me this recipe a few years back. She served it on Easter Sunday and it was a huge hit. Especially with my hubby who claims to be somewhat of a carrot cake expert. 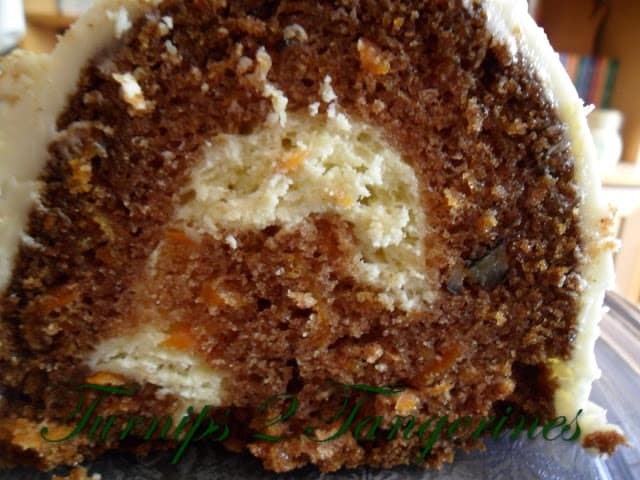 Try this recipe for carrot cake and see what your family thinks! A new twist on an old classic. 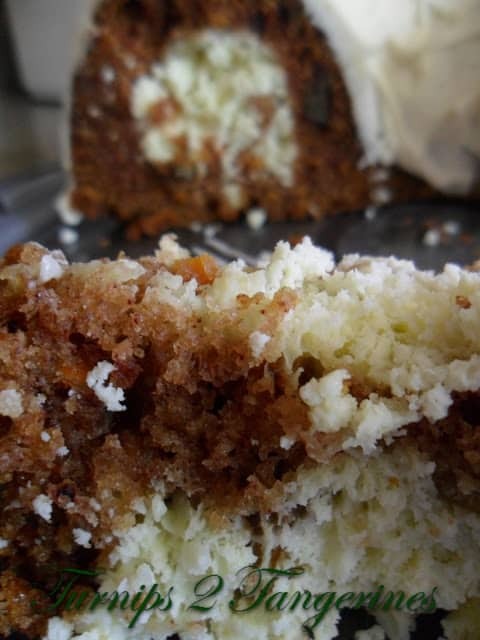 Carrot cake made with a layer of cream cheese. In a mixing bowl, beat cream cheese and sugar. Add egg; mix well. Refrigerate while making cake batter. In a mixing bowl, beat the eggs and sugar. Add carrots and oil; beat until blended. Combine the flour, baking soda, cinnamon, pumpkin pie spice, and salt. Add to carrot mixture; mix well. Stir in chopped pecans. Pour 3 cups batter into a greased and floured 10-inch bundt pan or fluted tube pan. Spoon cream cheese mixture over batter. Top with remaining batter. Bake at 350º for 55 to 60 minutes or until a toothpick inserted near the center comes out clean. In a small mixing bowl, beat the cream cheese, butter and vanilla until smooth. Gradually add confectioners' sugar. Beat well. Looking for more Easter recipes? Try these; Strawberry Bread with Pink Glaze and Vegetable Bundles. Your recipe is featured on Full Plate Thursday this week! Hope you are having a great weekend and enjoy your new Red Plate! I love it! There's a substitute for the cream cheese filling? Love the surprise! Thanks for joining us this week at the Let's Get Social Sunday party. Have a wonderful week! Oh Girl. You are SPEAKIN' MY LANGUAGE with this lovely recipe. OH MY! Looks fabulous…I will definitely be looking for a reason to make this yummy dessert. (I don't dare make it and keep it in the house!=) Thanks so much for sharing at Weekend Potluck. Looking forward to what you bring to our table next time. I love carrot cake and this looks amazing!! What does the filling taste like after baking? Is it still soft and creamy?